National franchisees around the country agree that Connover Packaging helps them stay on top of their deposit supplies, manage costs, and ensure continuity of supply, thanks to the Connover "Complete" Package. It starts with a dedicated account manager who is assigned to your business to ensure you get exactly what you need, when you need it! We understand the importance of same day shipping on our stock bags. So when you order by 3 p.m. your bags are on their way by 5 p.m. Need a cash bag that meets special needs? Connover can customize the size of your bag as well as closure type, logo, color (bag and text), even MICR-encoded custom deposit slips. At Connover there are no minimum orders – order 10, 100, 1,000 or 10,000 and we’ll ship them on their way. We offer fast, easy ordering – by phone, e-mail, fax or online. Connover’s "Stock and Hold Program" offers warehousing and distribution convenience. Your bags are available where and when you need them in manageable quantities. Connover can accommodate centralized or decentralized order fulfillment and shipping. Order from corporate and we’ll ship a pallet to your warehouse. Better yet, let us ship specific bag quantities directly to your franchise locations. Reduce your paperwork with one single monthly invoice. 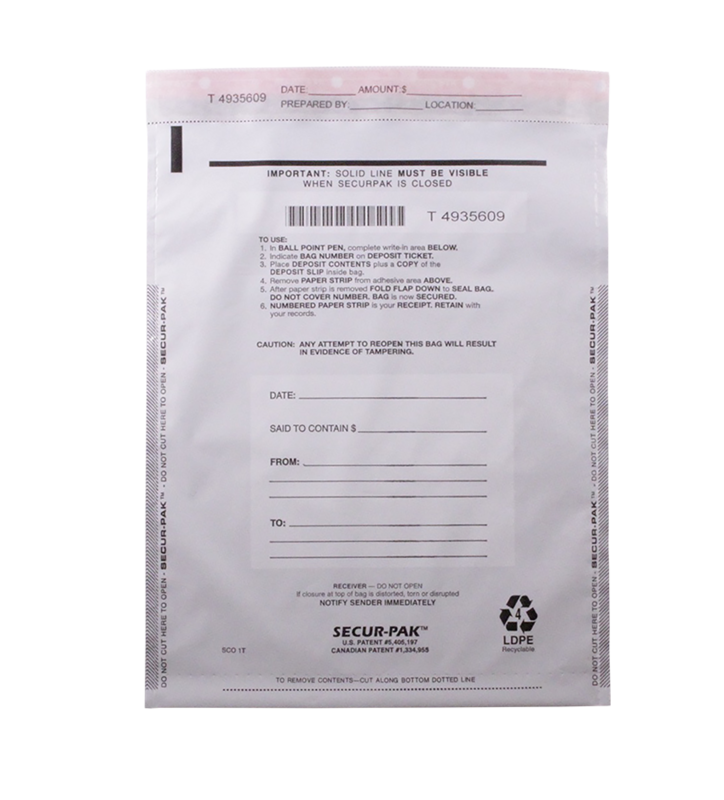 Featuring SECUR-PAK™, these bag designs are some of the most tamper-evident in the industry – incorporating an array of sophisticated security features to detect if the bag is tampered with or an unauthorized individual attempts entry. Save time and money by ordering high-quality, bank-approved deposit slips direct from Connover. Business and bank account information are pre-printed on the deposit slips. Conversion to our deposit slips is simple and we’ll help you make the easy transition.